The black rat is very smart, and it is not possible to capture it by the usual process easily. I captured the black rat while trying and erring. And, the black rat has been exterminated from among the house. It would be greatly appreciated when becoming reference of the black rat capture. It is about 15-20cm, and weight is 100-200g in the length of the tail that is about 10 percent longer than the length. Eyes and ears are big. The tails are a little longer than trunks in a slight body. The belly is tea brown with thick back the color of the body. It lives in a dry place in the back etc. of the ceiling at home. Moving ability is high and the learning ability is high. (It is smart, and is wise. )The ability to swim in water is low. It is cautious. It can vertically climb the wall because it lived originally on the tree. Longevity gives birth to children of several two-at a time for 2-3 years. It doesn't eat a high density bait poison because it is cautious compared with the raticide. 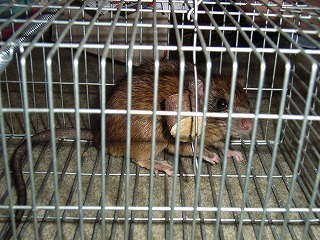 The number of black rats of drug resistance (It is said the super rat) increases, and capture is difficult. 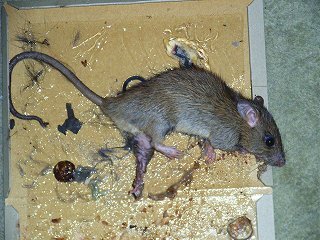 Three kinds of the wharf rat black rat mouse of the rat that invades the house are the main. The capture of the black rat is very difficult though the wharf rat and the mouse can capture comparatively easily. The black rat is smart or it is not possible to exterminate it with a usual poison and the capture machine easily. It was possible to finally capture it by perseveringly changing the place of the pressure sensitive adhesive sheet, changing the kind of the poison that disturbed the head, and doing for years how many. It is difficult for the country and the farmer to lose this completely though there only haves to be no food in the house. Able to exterminate putting into the state without food except in the refrigerator at all or earlier and it is not possible to know. It was possible to capture it for the first time though it was thought that it was not possible to catch in the capture machine (rat capture). It only began though the black rat had not already thought that it was. A strange sound was heard in a certain day back of the ceiling. It is a scratching sound as for the metal. Because it was too a loud sound, the cat thought entering. Then, the black rat was in the capture machine. The exterminating method tested most one. It was possible to catch only once though the capture machine that put food and the capture machine like the cylinder were tried. It was not possible to catch only by the pressure sensitive adhesive sheet easily. It has captured it by using together about the pressure sensitive adhesive sheet and the poison. The poison looked for black rat's head and it looked for the one to make them confuse it in the do-it-yourself store. The pressure sensitive adhesive sheet is set to various places in the house at it and a simultaneous period. The black rat that cannot capture it with the pressure sensitive adhesive sheet at all is I see if usual when it eats the poison when it is possible to capture it with the pressure sensitive adhesive sheet easily. The black rat also has captured it by this method with several mice a day. It is possible to have caught by interest. The method of capturing the black rat was comparatively easy this time compared with the method before. It introduces the way. It opens the door by about 4-5cm without completely closing the door at the entrance of the room in the kitchen, the living room, and the bath, etc. before it sleeps. The entrance is set and the pressure sensitive adhesive sheet is set to the entered immediate place. When it is this, it is not necessary to prepare a lot of pressure sensitive adhesive sheets, and food is not necessary either. It is only taken care that man doesn't hang in this pressure sensitive adhesive sheet. Making it not go to another place if the pressure sensitive adhesive sheets how many are prepared as other methods, and it doesn't pass there and arranging it seem to be also effective. The black rat doesn't hang easily because it is smart if the place where the pressure sensitive adhesive sheet is put every day is not changed. The pressure sensitive adhesive sheet is set back of the ceiling and do catch of the black rat. The pressure sensitive adhesive sheet is set to the part that became thin like the passage back of the ceiling all over. The black rat doesn't hang in the pressure sensitive adhesive sheet easily because it is smart. It is likely to hang carelessly in the pressure sensitive adhesive sheet that I set even if man is smart. The black rat might be also careless or it is likely to hang in the pressure sensitive adhesive sheet. It is also effective to sometimes change the place. Are not the photographs of the black rat that sees easily too much it and I'm sorry. It is a feature that eyes and ears are big. The size of the pressure sensitive adhesive sheet is about 20X30cm. It is a thing sold to the hundred-yen store. The direction of the width becomes about 20cm in this photograph. There were 35cm in the total length 180g in weight maximum one that had been captured by the current. It was fat from the one in this photograph. This hung in the one that only one pressure sensitive adhesive sheet was put on the entrance of the room. The entrance of the room was opened by about 5cm. It is the one that invades the house somewhere again even if the black rat is completely exterminated. It is often opened the window somewhere in daytime, and invades there. It invades from the window of the second floor and the third floor even if the window of the first floor is closed. The black rat can climb it even with a vertical wall. It is likely to invade the back of the ceiling from a small little hole under the roof. Moreover, it is likely to invade from the outlet. It is a fact that there is no trap in all outlets though the invasion can be prevented if the stench measures are trapped.